Spring migration in the area happens in April and May! Blowing Rock is located on the Blue Ridge Parkway and bordered by the Pisgah National Forest, providing close proximity and easy access to a multitude of habitats. This area of the Blue Ridge Mountains provides a home for about 160 breeding species of birds, with over 250 species appearing with regularity during migrations. In fact, the High Country is one of the most diverse breeding and spring migration areas in the eastern United States, with large numbers of neo-tropical migrants and forest interior species. Several species, like the Canada Warbler, are at the southern-most end of their breeding range while here, contributing the wide assortment of birds found in our backyard. When is the best time to view birds in Blowing Rock? Anytime! Spring migration in the area happens in April and May, and September is the best time to see fall migrations. The months between are great for viewing breeding species. Winter months are host to our year-round residents like crimson Cardinals and cheeky Juncos. The species list on the High Country Audubon site is especially helpful if you want to time your visit to see certain birds. Which species can be found here? Get an update on which birds are in the area right now. 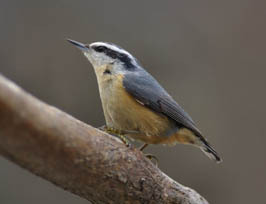 – Call the Watauga Birding Hotline at 828-265-0198 for recorded information on recent sightings. Where can birds be observed? With so many undeveloped areas near Blowing Rock, birds can be seen almost anywhere. Spending time on park benches or in quiet meadows on the Blue Ridge Parkway will reveal many species of interest. Many of the best places for bird viewing have become designated sites on the North Carolina Birding Trail, a state-wide collection of great birding sites and communities. Here is a list of sites closest to the accommodations, dining and activities in town. The North Carolina Birding Trail recognizes many more sites in the mountains, piedmont and coast of our state. To see a full listing, and to get more information on the sites above, visit www.NCBirdingTrail.org. Click the calendar link at the top of this page to see other events happening in the area. The attractions tab will show you what else the area has to offer during your visit. If you are coming to see a crimson Cardinal in the snow, don’t forget about our great local ski slopes. When here to see summer Warblers, plan to stay over for an Art in the Park show. Our restaurants and accommodations are great any time of year.